Recapturing Memories of the Black Ark is a sculptural installation that serves as both a literal and metaphorical platform for music and performance. Simmons is best known for his “erasure” drawings, partially erased chalk drawings on chalkboard walls — works that evoke a sense of loss and convey the persistent power of memory, foremost around the erasure of black voices and bodies. In Recapturing Memories of the Black Ark, a similar ghostly residue remains in the space through looped video documentation of the musicians’ performances. 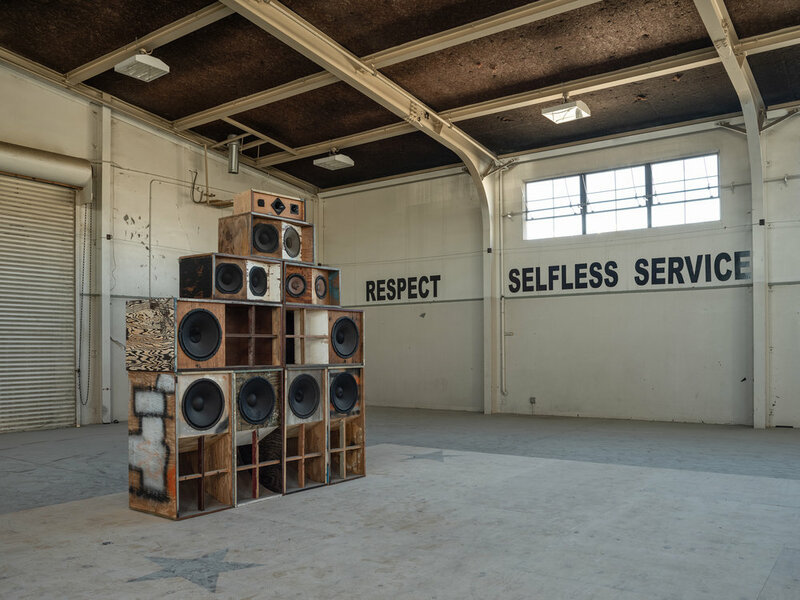 Inspired by the Black Ark, Lee “Scratch” Perry’s famed Jamaican studio and the site of the birth of dub, Recapturing Memories of the Black Ark includes a series of speakers hand-built from vintage parts and wood scavenged from the Treme neighborhood of post-Katrina New Orleans. Each performer can reconfigure the speakers according to their needs. Listen to an interview with Gary Simmons on the Desert X 2019 Podcast here.